Scenes from the 2016 Invasion Car Show in Deep Ellum, Dallas, TX. 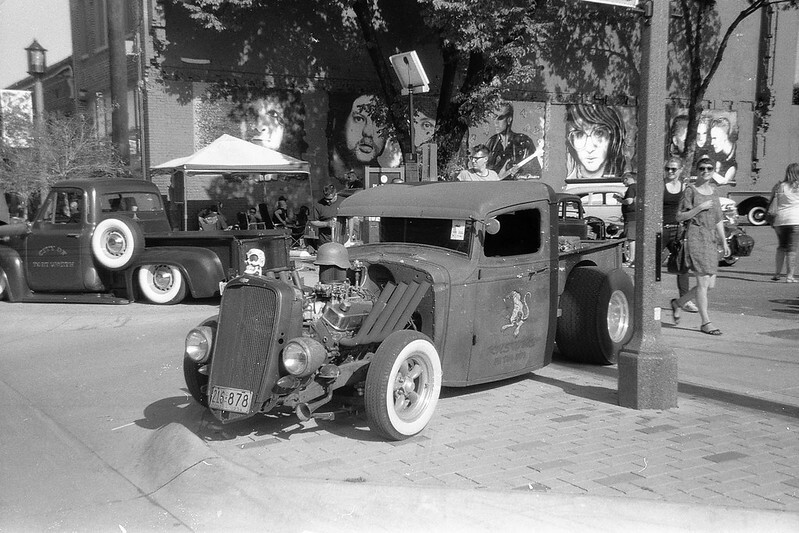 Shot on expired Kodak TMAX 100 film with an Ansco 1065 camera. I acquired this plastic 35mm camera at an estate sale in Dallas, Texas for $5. It has an Ansconar f:8 45mm fixed-focus lens, no shutter speed settings, and minimal control of the aperture via "cloudy" and "sunny" iconagraphic settings. For a cheap plastic camera it actually seems reasonably sturdy and well-made. This camera is not a "real" Ansco. It was made by a Hong Kong company called Haking, who purchased the Ansco brandname from GAF in 1978. You can find more information about this camera in the Ansco 1065 article at Camera-Wiki.org. Image published by steevithak on 2016-11-10 23:48:11 and used under Creative Commons license.